Markus Zusak, The Book Thief (Knopf, 2007). I must confess that my 13 year old daughter read this before I did. I’m glad she introduced me to it. I can’t say enough good things about this great book. Imagine writing a book on Nazi Germany and the Holocaust that is morally serious without being depressing. Imagine writing realistic fiction about the horrors of war that still has plenty of humor. Imagine vivid, fantastic, heartbreaking characters, a plotline dominated by WWII and the Holocaust, and an uplifting book that is full of death, prejudice, ignorance, struggle, pain, and the reader’s constant feeling of “And here I thought MY family was crazy!” Imagine trying to portray ordinary Germans, including the pro-Nazi ones, during that era in a humane manner without downplaying the horror. Now imagine trying to do all that in a book for older children and teens. The Australian writer, Markus Zusak, pulls it off amazingly in The Book Thief. He uses the technique of making Death the nearly-omniscient narrator. But this Death is not a grim reaper or malevolent force, but a world weary bureaucrat doing his job and telling this story as a way to convince himself that humanity is actually worthwhile. 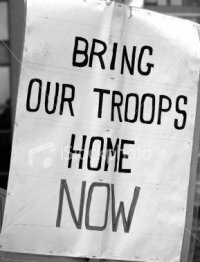 One of great passages has Death refute the old adage that War is Death’s friend. Instead, he describes War as a nagging boss that gives one far too much to do and then looks constantly over one’s shoulder and complains about the quality and pace of the work! The Book Thief tells of one orphaned German girl, daughter of parents who ran afoul of Hitler by being members of the Communist Party, who is sent as a foster child to a poor and dysfunctional married couple with grown children in the town of Molching, outside Munich. It tells of her foul-mouthed foster mother who is good in a crisis, but who never learned any way to show love and affection except through heaping verbal (and sometimes physical) abuse on her husband and foster daughter. It tells of her mostly-silent, foster father, a house painter who can get little work because he is not a member of the Nazi Party and who must play the accordian in bars to try to enough to keep the small family from starving–and who takes time to teach his foster daughter to read. It tells of a boy befriending a pre-teen girl, a German boy who has Jesse Owens as a hero and once painted himself black before going to race around the track, mentally recreating the 1936 Olympics! It tells of a family hiding a Jew from the Nazis–of art and fist fights and hunger and cigarettes–and stolen books. Warning to parents: Although very humorously done, there is quite a bit of profanity in a book for older children and teens, much of it in German, but usually Death translates to English! There are no perfect characters as role models. There are no saints in this work and plenty of sinners, but at least some are trying to become fully human. And there are many moments of grace. Yet here is a work that can help young people (and old folks like me, too!) grow. The Book Thief entertains (I could hardly put it down) while peforming the indispensible act of all good literatue: illuminating our moral world. After last year’s peace camp, I profiled Rae Hunter as one of the great young leaders who grew up in the organization. She is Daniel Hunter’s sister and Daniel was profiled below. 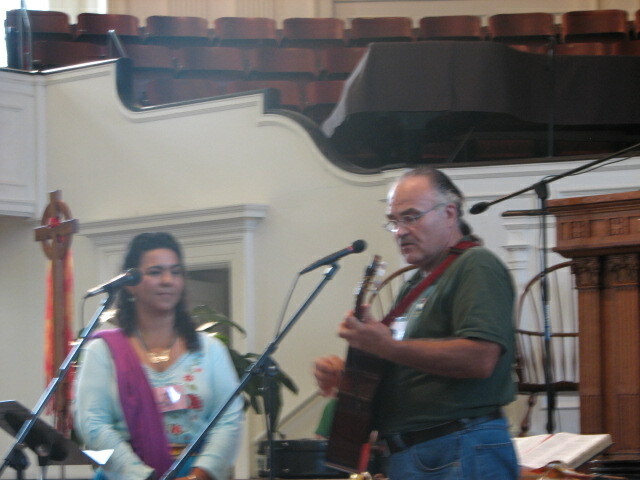 She is an arts and theatre major at university and just returned from a several week stay in El Salvador with either Witness for Peace or Christian Peacemaker Teams, I forget which. 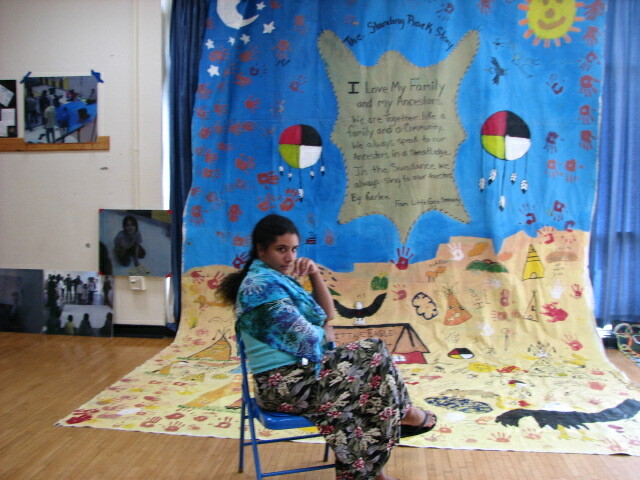 She was one of the lead artists on the peace mural. My daughter, Molly, took this picture of Rae in front of an earlier mural. The two were much taken with each other. Molly has an artistic side which she gets from her mother, and combines that with a strong analytical side and a passion for justice and peace which she gets from both of us (and her own gifts from God). Rae has a similar combination of gifts and I think Molly found a heroine in this striking and articulate young woman. I would much rather her have heroines like Rae than some teen idol singer or actor with shallow intelligence and even shallower morals! I took parental pride in finding that Rae was also impressed with Molly. 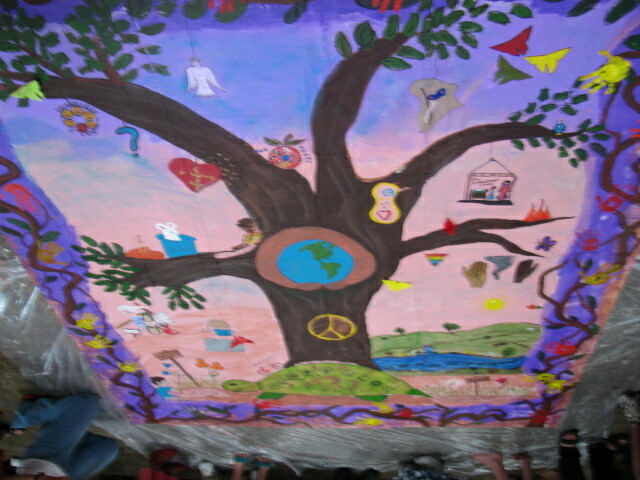 The artists populated this world tree with objects that represent the assetts these individuals bring to the peacemaking process. The message of this mural is that the tree of peace is the result of our many contributions. I am a champion of a two-state peace in Israel, Palestine. I have argued that the U.S. should be talking with our adversaries in Iran and I have been very discouraged at the return of Iranian hardliners after reformers had made so much progress in pushing Iran toward true democracy. But all that aside, I must say that the Holocaust denial conference organized by Iranian president Ahmadinejad has sickened and outraged me. My next door neighbors growing up, the Goldbergs, were Holocaust survivors with numbers tattooed on their arms. My maternal grandfather saw the liberation of some of the death camps at the end of WWII. The Nazis themselves kept meticulous records of this most systematic of genocides. Holocaust denial, along with Holocaust relativizing, is now widespread in the Middle East and part of a growing anti-Jewish plague (fed by the Palestinian-Israeli conflict) around the world. It must be denounced wherever it raises its ugly head. The U.S. is not blameless: we turned whole ships of fleeing Jewish refugees from our shores and we refused to divert any planes from the war effort to destroy either the death camps or the train tracks leading to them. And anti-Semitism was common enough among my own fellow Baptists that many here initially cheered Hitler prior to the war. And anti-Jewish beliefs are still common throughout the world. None of this justifies the policies of the state of Israel toward the Palestinians (as many Jews themselves point out)–but neither does the actions of Israel justify the evil of Holocaust denial or the resurgence of anti-Judaism and anti-semitism. I am sickened beyond belief.